Why do I take a pen, sorry, a keyboard, once again? Last time I wrote that there are no routes distinctly specified for exports in the Ukrainian GTS because this gas transmission system was developed in such a way that the task of gas supplies to Europe conflicting with the task of providing internal gas consumers. However, recent events have revealed that this conflict situation is not the only problem for European countries consuming Russian gas transmitted via Ukraine. 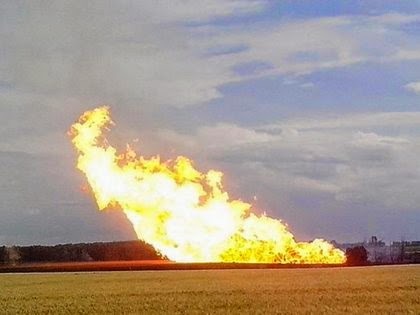 On 17 June 2014, there was an explosion at the part of the gas pipeline in Poltava region (Ukraine) providing gas supplies to Europe. Different explanations of this accident were made public from a terrorist attack aimed at discrediting of Ukraine as a reliable transit operator up to an ordinary technical breakdown. Meanwhile there is a question whether that breakdown is an ordinary one? Official name of this gas pipeline "Urengoy-Pomary-Uzhgorod". Now reviewing a background information of that pipeline we can see that the pipeline was built in 1982 -1984 or 30 years ago. Referring to the same background information, at those times the Khartsyzsk plant produced for the pipeline "Urengoy-Pomary-Uzhgorod" double polyethylene coating pipes. A normal operating life of these pipes are 12 years. However, I would like to refer to the Ukrainian information agency says: "Governor of Poltava region Victor Bugaychuk announced that the gas pipeline been in a critical condition. There are 11 repair patches in that part (of the pipeline - my comment). Naftogaz refused to provide financing for repair works”. And now your attention is necessary: strategic pipeline to Europe built 30 years ago with exceeded time limit coating has never been under repairs!!! The question is how many such unsafe pipelines in Ukraine are in use for supplies of gas to Europe. As you understand, I am asking rhetorically while the answer to that question does not grant any optimism. Somebody will oppose that there were no termination of gas supplies to Europe yet. Yes, that is correct, but it takes place during summer because of seasonal underutilization of other pipelines' capacity. Moreover, do you imagine what will happen in winter season? However, it looks as if Mr. Yatsenyuk has found an opportunity of obtaining finance for repairs and upgrading of gas transmission system. It is assumed to create a company - transmission system operator where 49% would belong to Americans (remember the younger son of US Vice President Joseph Biden...) as well as European investors and Ukraine will possess the rest of 51%. It is an interesting proposal. In fact, are American and European investors ready to put their money into the Ukrainian GTS? According to different estimates the total amount is in range from 2,5 to 17 billion USD which could burden the European gas consumers. Meanwhile the upper figure is already comparable with the costs of the luckless South Stream project which is under construction based on modern technologies and pipes produced in Europe and is free of transit risks. I fully agree with the President of Austria who supported South Stream project implementation and made possible for Austria to feel securely in energy matters. I do hope that you understand why?.